Feel At Home Away From Home At This Heritage Hotel In The Heart Of The City! Looking for a weekend (or weeknight) getaway minus the road trip? Hit up Casa Cottage in Richmond Town to feel like you're at home away from home. Nestled in a bylane in Richmond Town is Casa Cottage owned and run by the same people who started the popular European ‘Casa’ restaurant chain way back in the 70’s. If you think that’s ancient, then you’re in for a delightful surprise. With a mission to ensure that guests “call it home”, the hotel offers 18 unique rooms across budgets. The standard rooms start at INR 2,500 per night and include basic amenities including WiFi (they might be heritage, but they’re up to date with the 21st century). 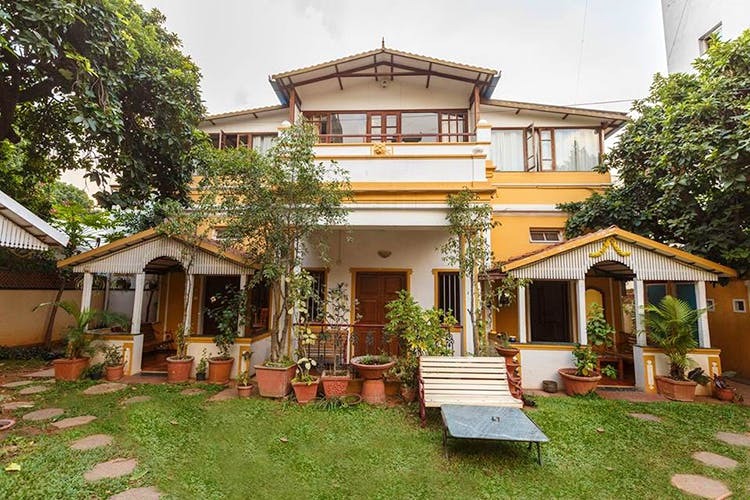 Their most expensive type of room are the deluxe studio that includes a balcony or porch depending on which floor you’re on, sit-in lounges and a kitchenette for around INR 3,900 and can comfortably house 3 people. The room prices also cover breakfast that changes periodically. We love that this place offers a view of a quiet and leafy garden. Perfect to snuggle up with your bff, significant other, or furbaby. It is also couple friendly, so no judgement here. For the basic rooms, the prices are a little steep. But that is probably due to it being prime location. We also found that in monsoon, some of the rooms are a bit musty, and dark. They also don't have an in-house restaurant, so don't treat this like a full-fledged hotel. Call them up directly before confirming your reservation online as they might have promotional deals for rooms running offline. It can be cheaper than on the website!